The Jasper Engineered Hardwood Handscraped Maple Old West Collection will add an elegant country-inspired look to your home. Crafted with a rustic handscraped surface, this real wood flooring offers eye-catching character for your interior design project. Blending the traditional beauty of hardwood with the enhanced durability of engineered flooring, this collection is an innovative and versatile choice. If you’re looking for quality engineered hardwood flooring at manufacturer-direct prices, BuildDirect has you covered. Check out more about this flooring below. Natural warmth and beauty: maple offers tight graining patterns and a uniform texture, which allows this wood to be sanded to a beautiful finish. The eye-catching chocolate brown coloring enhances the maple’s natural beauty. 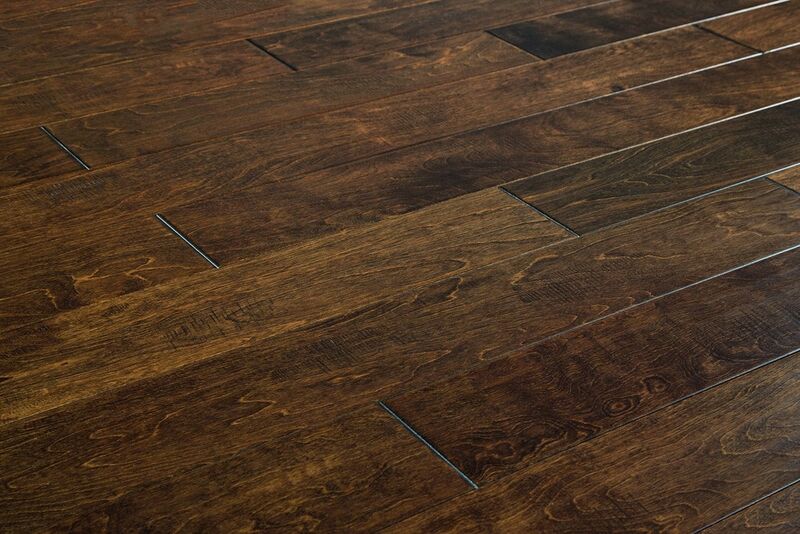 Attractive satin finish: offering some sheen, this engineered hardwood’s satin finish will give your space a classic, yet contemporary appearance. A popular choice with homeowners, satin finish floors show scratches and dirt less, making them easier to maintain. Install throughout your home: suitable for both above and below grade installations, this engineered hardwood flooring allows you to achieve the look of real hardwood in spaces where solid hardwood is not recommended - even basements. Installation choice: expertly milled with tongue and groove edges, this engineered hardwood flooring can be installed using a glue, float, nail, or staple down method. Coated for durability: for lasting protection and enhanced scratch resistance, these quality floorboards are finished with 7 coats of Treffert Aluminum Oxide. Create a warm and inviting space: this flooring can conveniently be installed over radiant heating systems, allowing you add comfort underfoot. Purchase with confidence: Jasper backs this flooring with a 25 year finish warranty and a lifetime structural warranty for residential applications. Plank dimensions: these boards offer a 2mm wear layer and measure 1/2” Thick x 5” Width x Random Lengths. Engineered Hardwood - Maple Collection - Maple - Milano / 5"
We love the new look this flooring brought to our home. Installation went very smoothly. 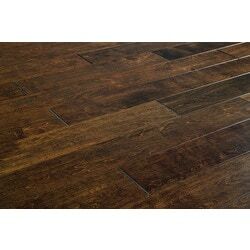 Highly recommend if you're looking for a more affordable option than solid hardwoods and still want that beautiful hardwood look. Product was excellent quality with very little waste due to twist, bends, poor finish, or engineering. We have used this same flooring in several houses, it looks rich and goes with most interior decorations. Highly recommended.